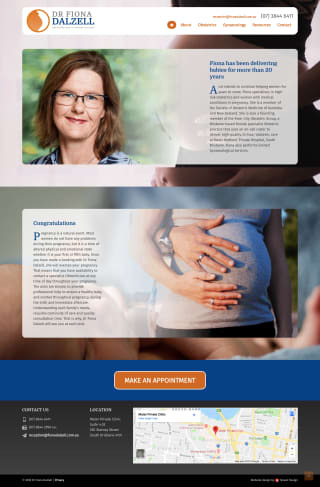 Dr Fiona Dalzell is a Brisbane-based female specialist obstetrician and a former client with the River City Obstetric Group (RCOG) whose website I built a few years ago. After the positive experience building that site, Fiona wanted me to undertake building a website specifically for her practice. Processwire was used as the CMS for the RCOG site, and was used again here to ensure consistency in the process of maintaining site content. After just a few weeks the website was already enhancing the services provided at the doctor's practice and had been helpful when recruiting a new member of staff. I have been happy with the quality of work produced by Tyssen Design for the development of my new website. John was attentive to my needs and was able to adapt as my brief changed directions. He was careful with his explanations, making computer terminology meaningful to a lay person. I feel I can trust John with any issues regarding my website.